← Monday Question – What Is Your Newest Fragrant Discovery? When I was in London in May, I had not only the good fortune to meet with Christopher Chong, the amazing creative director of Amouage, but I also got the chance to smell Interlude Woman and Man as the first person ever outside the company. Christopher swore me to secrecy and I complied of course, but thankfully the time of keeping the pleasure of smelling Interlude to myself is over. The new perfumes have launched in the middle east and are set to launch worldwide in July (September for some places). Interlude Woman was created by Carine Vinchon Spehner and includes notes of bergamot, grapefruit, ginger, marigold, incense, rose absolute, orange blossom, helichrysum, jasmine, opoponax, vanilla, benzoin, amber, sandalwood, oud, oak moss, leather, tonka bean, animalic notes and musk. To me Interlude Woman has many faces. It is a perfume that is hard to categorize, that keeps you guessing and just when you think you have it pinned down it shows you sides of itself (or maybe of yourself?) you least expect. What strikes me first when applying Interlude Woman is its harsher side. A strident, self-confident, spicy and woody floral heralds its unmistakable presence and commands attention and just when it gets that desired attention it draws back, lures you in, takes you with it into a calmer, softer heart, full of delicate floral curlicues and decorations. In the end you come willingly, bewitched by the softness that came out of nowhere, you relent and give in to a tenderness you perceive somewhere in there, that you hope to find when the commanding, sharp nuances of the opening fully withdraw. Only they never do. Interlude keeps you on your toes, doesn’t let you relax into the nebulous softness, there is a strength underneath it that can be dangerous, almost. The many faces of Interlude Woman can seem chaotic at times, only to resolve themselves into recurring moments of perfect clarity again and again. The seemingly rivaling accords of almost masculine spices and woods and the tender, feminine florals dance a powerful choreography around a core that is imperturbable and stands like a rock in the midst of all that agitation. This rock, this dark tower of balsams – myrrh and frankincense, which can’t be absent in any Amouage perfume – stands tall, anchors the composition, so it never fully descends into a chaos that is only hinted at after all. Interlude Woman will not be an easy love for most people, I dare predict. But for us perfume-crazy folk, Interlude is a challenge to take on gladly. It will keep you on your toes, it will make you think and in the end it will make you smile and say to yourself – this is why I love perfume. Samples provided for review by Amouage. This entry was posted in Amouage, Chypre, Floral, Fragrance Reviews, Spicy and tagged Amouage, Carine Vinchon Spehner, Christopher Chong, Chypre, Interlude. Bookmark the permalink. A very enticing review, I can’t wait to try it! It sounds like a different direction for Amouage. It does! I think that direction is also evident in Opus VI already, chaos and contradictions seem to be a theme of Mr. Chong’s. Yay! I have been eagerly awaiting your review of these since I got to smell them here in Dubai at the Boutique the other day. I think it is the Interlude Man that is the one I absolutely can’t stop smelling, such a wonderful smokiness that is still on the card days later (but, I am not positive because I stupidly didn’t label the strips right away). But both are so wonderful that I can’t wait to go back and try them on my skin. 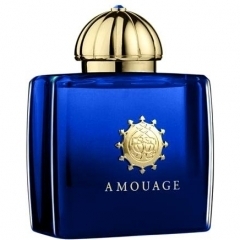 Amouage, as you said, is not always the easiest perfume to love but, for some reason, Interlude immediately intrigued me. I am jealous of your meeting with Christopher Chong…lucky you! Lucky me indeed, he is a very lovely and interesting man! Oh you bought it? Great! Enjoy! Grapefruit always worries me in a list of notes, but this sounds fascinating. It also sounds like a perfume you have to live with for a while rather than an immediate love. And it helps that the bottle is just GORGEOUS. Honestly, I don’t smell grapefruit as such in here. It is part of a very wellblended opening accord, but I can’t make it out in its own. This is definitely a “let’s get to know each other slowly” perfume, rather than love at first sniff (only my opinion though). Wow, what a captivaing and intriguing review! Quite a departure from Honour Woman and Beloved then. These kind of complex perfumes that keep you guessing are a favourite of mine too. They are so much more interesting. So many wonderful new things to try at the moment. Right, is is a departure from Honour and Beloved. It follows more in the footsteps of Opus VI, I think. Sorry about that. I meant to finish by saying more intriguing. It is an intriguing perfume, very unexpected and unusual. I have a sample of Epic Woman in my collection so obviously, I tried it already and it left no traces behind. I might revisit it tonight though. This particular nose is fairly new to the scene, but I’ve really enjoyed her work so far. She tends to be a bit more delicate in her work than what you describe here, so it sounds as if she’s found some new confidence and boldness by working with M. Chong, and that’s very exciting. I can’t wait to try this one! She did a few perfumes for L’Artisan which is why she is a bit familiar to me, and seeing her former style of work this is definitely a departure. I look forward to hearing your opinion, Marla! She created Opus III and Memoir Man, also, but I haven’t tried either. How do those 2 compare to the new one? I have the opposite reaction to Undina, which is “why do they keep putting perfumes I don’t like or know I won’t like into beautiful blue bottles? !” 🙂 This one doesn’t sound like my thing, but of course I will smell it, and even if I don’t like it, I can admire the bottle from afar. Mmm, intriguing indeed. Do you get a nice dose of ginger? I love that note — it’s always very energizing to me. And I like the way you describe the rivaling masculine and feminine accords and the way this one is a bit challenging. I don’t really get the ginger most of the time, it is a very well blended perfume. What is prominent to my nose is the marigold which makes it quite unusual. I think this is very much your kind of thing, Suzanne! I am in love with the blue bottle. But will hold off until I smell the juice. After all, I love the blue bottle for AG Nuit Etoilee, too. But after being “sales pitched” by two different associates on separate occasions at Saks, I still don’t like NE enough to buy that bottle. There are a few Amouage scents I really like and have decants of, but I haven’t been able to bring myself to spring for a full bottle. Mainly because I can’t decide on just one and can’t find the correct logic to justify purchasing more than one to my DH, the CFO. But I am looking forward to trying this one. Especially, since you created a lemming with your captivating review. Maybe it will be the one to end up on my birthday wish list. If it is not outright love, it is difficult to decide for just one FB. I hope to hear what you think once you’ve tried it. I think it will be a very polarizing scent. Can’t wait to read other reviews. Won’t ever happen, but the idea is nice, isn’t it? Love, love, love your review, you’ve captured the essence of Interlude Woman so perfectly! Thank you, I’m so glad we see Interlude quite similarly! Just seeing the notes makes me think I’ll like it a lot. I’m sure that you will love the Man version (review up next week), it says “Ines” loudly and clearly. Did everyone notice that you can now buy Interlude at the Amouage online Boutique? The promotional video is also quite beautiful. A new 12 fragrance sample set (men and woman versions) seems to be coming soon as well – I can’t wait. Yes, that has never been the case that it is at the online boutique so early. I fell for this, hook line and sinker, after just one brief day together. I’d had a sample for quite a few weeks but not felt inclined to try it. Until today. After several days of feeling under the weather I needed a change, a boost, and so on a whim I reached for Interlude. I sprayed once on each wrist, and without thinking much more about it I went on my merry way. And then it started to happen… what was it? Why was I suddenly feeling so, so… good, so present? Where did this burst of energy come from? In the afternoon, after a second spritz (greedy more than necessary), I thought to myself, okay, my husband will hate this, but I don’t care. This is medicinal, this really works and I need it! But then he came home, kissed me and said the magic words: “Ooh, you smell wonderful” and took me out to dinner. It is the best feeling when a perfume we love is also appreciated by the people we love. I’m glad you and you husband enjoy Interlude so much. Thank you for your fantastic review! I had the chance to finally try it today (sprayed on an hour ago) and it indeed keeps my nose and my emotions very busy, this scent. It actually dances on my skin and luckily it doesn’t come out manly at all. I might have found a new love, depending on the further direction of this dance…. it is quite a ride, huh? test than you can consider yourself perfectly eligible to enter degree training program either for associate. If you want to know more about the treatment, you can email me: kidneycn2010@yahoo.